Why install Skylight – Skylight Benfits! Traditional Flat Glass Skylights – These skylights were ranked the best model of skylight for energy efficiency in residential applications. Installed on all roof types, variety of sizes and versions. Popular because they can open up a room making it feel larger and more comfortable while adding to the overall decor. Solar Tubes – Sun Tunnels – Sun Tunnel Skylights and Solar Tube Skylights are by far the most versatile and popular Green Skylight product on the market today. With an affordable price and excellent quality they actually bring in as much light as a much bigger traditional skylight. Dome Skylights – Becoming popular in the 1980’s and 90’s these skylights are great for open air environments or rooms that are not temperature controlled. Though they provide ample natural light Dome skylights are known to allow greater heat gain and heat loss than glass skylights this is really only felt on the coldest or hottest days of the year. Custom Skylights – Coming in most any size and shape there is plenty of room for customization. Custom Skylights are the most expensive skylight option and it can take upwards of 30 days to manufacturer depending on how complex your design is. You can get acrylic or glass. Deck Mounted – When you have a deck mounted skylight it means the skylight will be directly installed on to the plywood of your roof. The flashing then seals the skylight to the roof with a water-tight seal. You then put the shingles or tile back on top of the flashing around the skylight. You cannot install a Deck Mounted Skylight on a flat roof. VELUX offers the NO LEAK Deck Mounted Skylight. Curb Mounted – These skylights are not installed directly to the roof, they sit on top of a box or “curb” that is raised up, typically about 1ft. A curb mounted skylight is like the top of a shoe box and the Curb is like the bottom of the shoe box. If you have a flat roof you have to use this method. This is now known as the most secure, water tight method for installing a skylight because of the new advancements in how Deck Mounted Skylights are manufactured! Fixed Skylights – Non-operable skylights. They just let light in and allow you to see out! Manual Venting – Controlled by a telescopic rod you can open and close your skylight to allow for air circulation. Electric Venting – Controlled by a radio frequency remote control a motor will automatically open and close your skylights. 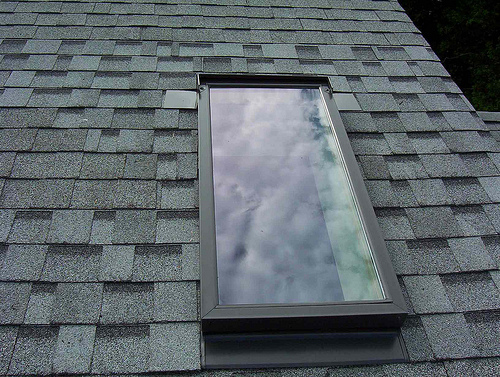 Venting skylights can recycle the stagnant air that is trapped with your home. The electric venting skylights From VELUX have a rain sensor that will automatically close your skylights if they are left open and it starts to rain. How do you Measure a Skylight? When ordering or describing a skylight, the measurements are always expressed as width (dimension horizontally across the roof) x length (dimension vertically up the roof). Curb Mounted frame sizing is taken from the Outside Curb Dimension. The Outside Curb Dimension is the overall outside dimension size (OD) of the of the finished built up curb. This can also include the applied roofing materials as taken from the top of the curb where the skylight is to fit. Skylights are sized slightly larger than the OD of the curb in order to fit over the top like a crown. You do need to specify with or without roofing material. Deck Mounted Skylights are measured in a similar manner. You measure the outside of the skylight base (In the picture below from 1 the metal to the opposite side) not the top aluminum skylight frame which most of the time is about 1” – 1.5” wider than the measurement of the base.